The momentum in the relationship between the Aquarius man and the Pisces woman depends a lot on their own personal characteristics. Although these two signs do have certain things in common, they also show certain opposite traits. The Pisces woman is very gentle and of a caring nature. This forms a striking appeal to the Aquarius man who will love to be with her. She is also a fantastic listener, which will go well with the witty and chatty Aquarius man. However, the Aquarius man needs to be aware that the Pisces woman can be someone who may not always speak out about things she does not like. There is only a certain point until this gentle woman will tolerate, further to which lie times of depression. The Aquarius man is extremely energetic, very outgoing and has a bursting social life. He likes to be out there, and be around friends. This is unlike the Pisces woman who is dreamy and likes to dwell into her inner self, at times. She will be drawn to the Aquarius man’s traits of being a complete extrovert. This is a world she is not used to and could be a welcome surprise. Emotionally, the Pisces woman is a sensitive and petite being. She is the woman who has the slow and feminine moves. One look into her eyes over a glass of wine, and the Aquarius man will notice the caring nature radiating from her within. This will be very appealing to him. He will be drawn to these feminine characteristics of the Pisces woman. He should however be very careful and not allow himself to take this kind Pisces trait for granted. If he starts treating her with the same enthusiasm as he treats others, the relation will surely head for stormy waters! The degree of romance for this relationship is high. 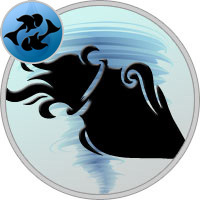 Although the Aquarius man may not be romantically inclined, he will be lost in the Pisces woman’s dreams and fantasies. Conversations will be intense and the both will develop a strong bond. He will need to understand that the Pisces woman needs her own space and moments of solace. Every date does not necessarily have to be in the popular cafe down the road or that funky club in downtown. The Pisces woman finds freedom in various forms of art and is very creative. The Aquarius man should be aware of this and think of spending quality time with her, ways he might not be accustomed to in the beginning. Long walks, sharing a quite glass of wine on the pier, a hot coffee on the balcony on a cold morning, these are things that may sweep the Pisces woman of her feet. The Aquarius man is usually a talented actor and his skills should do the trick here! Love relationship between the Aquarius man and the Pisces woman is intense. The Pisces woman will love to please and satisfy him, while he will be the one who takes lead. This will gel well with the typical traits of both signs. The Aquarius man will be introduced to the fantasies of the Pisces woman. It is usual for the Pisces woman to let go of her deepest fantasies to the person she loves and trust. Should the Aquarius man gain this level of trust, both partners are in for an "out of this world" experience in the bedroom! The Pisces woman needs to acknowledge the outgoing personality of the Aquarius man. He is a man of extra social needs and really enjoys his freedom as opposed to the introvert Pisces woman. Both partners will need to compromise and arrive at common ground in order to spend quality time with each other at places they like to go and the type of people they like to be with. Due to this prime opposite trait, there can be moments of despair and times of arguments. Although the Pisces woman is not the one to be aggressive in nature, dejection will surely show on her face and a bad vibe will be in the air. If both partners are able to make these adjustments and be committed to move the relationship to the next phase, they are in for a joyous ride!